A free UK dating site where you can chat, email and search for other members living near you. The site is designed for people living in the United Kingdom. The postcode search will help you find local people. 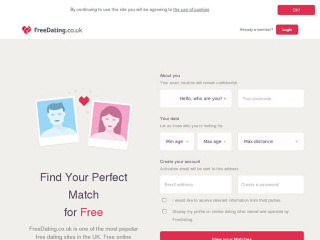 FreeDating.co.uk is OK if you want to explore something different from POF or OKCupid. There aren't any hidden membership fees or extras that I could find. The site doesn't allow you to search until you enter a valid UK postcode, and once you've done this, you are asked to fill out some registration details. Those who join can create their free profile and start browsing right away. Browsing is free and sending messages is free. Be prepared for a lot of adverts which can get very confusing in places. There is a standard set of tools, such as email, live chat and photo uploading. You can also make use of the bookmark and block features. Once you sign up, your account has to be verified. This cuts down on fake or empty profiles and allows the database to include a reliable amount of actual people. Something that gets annoying is the ads. There are a lot of adverts which can get a bit confusing because some of the links in the menu will take you off to other sites. Freedating.co.uk is a possible choice for those who are curious about online dating and want to get their feet wet and if you want to explore something different from the POF's or OKCupid's of this world. Though it allows for the opportunity to explore online dating without getting sucked into costly monthly subscriptions. The website's small database is specifically suited for those citizens located in the United Kingdom. Rss Feeds. Subscribe to comments for this site. [?] Receive updates about Freedating.co.uk directly through your newsreader. It will be right that Free Dating UK is a free online dating service with no hidden membership fees or extras. I believe that friendship is a gift that is fair in all things, hope to hear from you soon. This site is totally dominated by an immune clique of people who have no interest in dating as they have partners or are married or worse . The site owner, [Dan], is only interested in the money from his sponsors not the wlth the welfare of genuine members. He allows the cllque to rule and hurt genuine lost souls who are banned if they stand up for themselves. Avoid the site at all costs! The site should be investigated.His income suppliers told. There iis also the possiblity the owner and clique members could be sued or prosecuted for the way it iis run and the damage done to people. Your posting is very nice. Truedate4u.com is also a free dating site for singles living in the United Kingdom. It's a free and easy to join UK dating services, just register post your profile and start interacting with other members. This dating service is exclusively for the United Kingdom. Joining takes about thirty seconds and is absolutely 100% free of any charge. Once you sign on, you take a couple of minutes to create a personal profile to let all those other hot UK singles out there know what you're all about, and then you're free to begin browsing and contacting anyone that might catch your eye. Sign up for free today and get to stepping; you won't regret it one bit. FreeDating UK 1.5 4 A review of FreeDating UK. A free UK dating site where you can chat, email and search for other members living near you. The site is designed for people living in the United Kingdom. The postcode search will help you find local people.